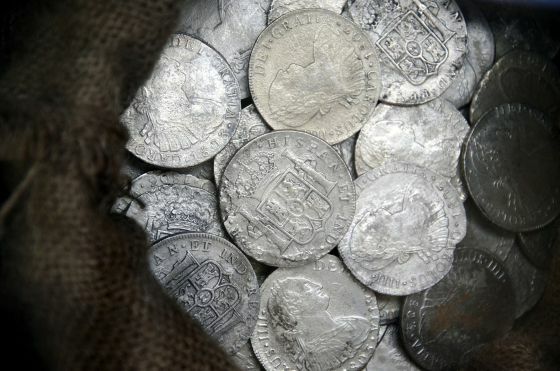 Five years after being scooped up from the seabed off the coast of Cadiz by US deep-sea treasure-hunting company Odyssey, and following lengthy legal wrangling over their ownership, around 8,000 coins from a much larger haul that was aboard a Spanish frigate sunk by the British in 1804 have gone on display at ARQUA, the National Sub-Aquatic Archeology Museum, in Cartagena. The Spanish government sees its success in reclaiming the coins as a major victory against companies such as Odyssey, which scour the world’s oceans in search of sunken booty. The case sets a legal precedent, providing Spain with the mechanisms and procedures to protect hundreds of its vessels lying on the seabed around the world sunk in centuries past. “This is an unprecedented international triumph against plundering and the illegal traffic in cultural heritage,” José María Lassalle, Spain’s secretary of state for culture, told assembled dignitaries on May 29 at the opening of a permanent exhibition about the vessel, Nuestra Señora de las Mercedes, which will focus on Spain’s fight to recover almost 600,000 coins worth an estimated half-a-billion dollars that Odyssey found aboard. The exhibition is divided into four parts: “New Routes and Inter-Oceanic Trade”; “Naval Construction”; “Nuestra Señora de las Mercedes”; and “A Legacy to be Protected ?”.